Home Minister Rajnath Singh pointed out that the Congress-led grand alliance was heading to a "huge defeat" in Telangana. 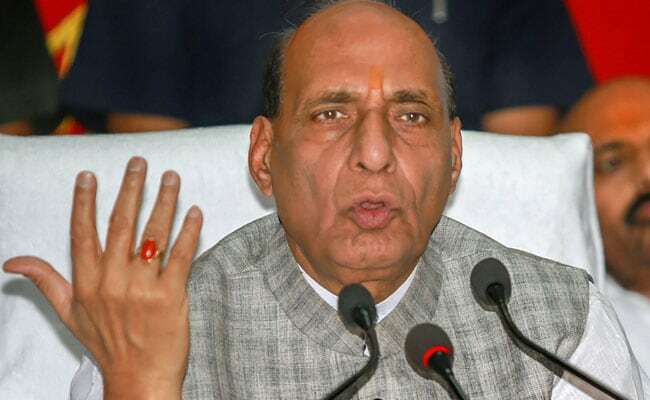 With election trends showing reverses for the Bharatiya Janata Party (BJP), senior party leader and Home Minister Rajnath Singh said on Tuesday the assembly polls were fought on the basis of the performance of state governments, rejecting the notion that the results would be a reflection on the central government. He also pointed out that the Congress-led grand alliance was heading to a "huge defeat" in Telangana, where the Telangana Rashtra Samithi (TRS) appeared set to retain to power with a big majority. Talking to reporters outside Parliament, he also congratulated all the winning parties and candidates. As per trends, the Congress was comfortable ahead of the ruling BJP in Chhattisgarh, and had an edge over it in Rajasthan. Both parties were locked in a neck-and-neck race in Madhya Pradesh while the Congress appeared to be losing power to the Mizo National Front in Mizoram.